The IHSA football playoff pairings were announced Friday night, at about the same time I was watching the most painful football game (or sporting event) I have ever witnessed. Damn you Spartans. Anyway, I’m going to post my thoughts on the match-ups involving the teams I saw this season in person. 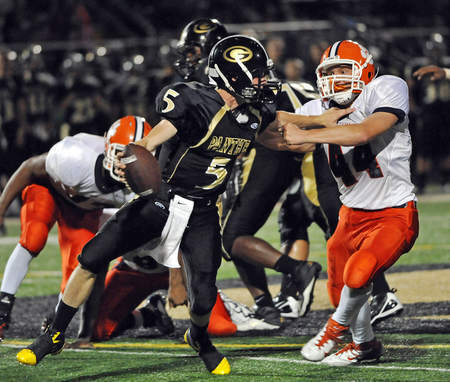 Here is the first installment of my mini-previews, focusing on the 5A games. I’ll post the mini-previews of the 6A, 7A and 8A games tomorrow. Montini, the two-time defending 5A state champion, enters the playoffs as one of the hottest teams in the state. The Broncos have won five straight games and have outscored opponents 276 to 50 over that stretch. The Broncos offense has transformed into a powerhouse since John Rhode took over the quarterbacking duties at halftime of Montini’s week six game against St. Francis. Rhode missed the first five games of the season recovering from a broken right thumb. In just over 10 quarters of play this season, Rhode has thrown for 1,100 yards and 22 touchdowns. Rhode has a strong stable of wide receivers to target. Jordan Westerkamp, a Nebraska recruit, is the star of the receiving corp, but Joe Borsellino and Anthony Taylor are talented weapons as well. Montini’s two losses came without John Rhode and at the hands of two 9-0 teams (Loyola and Marian Central). The IHSA didn’t give the Broncos any favors with their seeding. Despite the way Montini has looked in recent weeks, the Broncos were only given a six seed, and a rematch with 9-0 Marian Central likely awaits in the quarterfinals. Woodstock North won a share of the Fox Valley Fox division crown this season in only the school’s third year as a varsity squad. The Thunder overcame a 15 point halftime deficit last week in their 47-35 victory over Grayslake North. The Thunder, led by 5-7 fullback Ryan Wade, are a run-first team. They rushed for 333 yards during the second half of their comeback win last week. Wade had 33 carries for 189 yards in total last week. It’s hard to see Montini losing their first round game, but Woodstock North offense will present a challenge. Montini has done well against strong running offenses this season, defeating Marmion and St. Francis, giving up two touchdowns combined in those games. This class 5A 8/9 match-up features two teams with run-heavy offenses entering the playoffs with multi-game winning streaks. St. Francis heads into the playoffs on a three-game winning streak. The Spartans’ two losses to this season came to two highest ranked 5A teams, 9-0 Marian Central and 7-2 Montini. 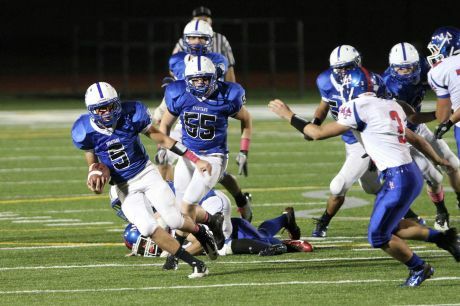 St. Francis features a run-first offense, led by running backs Jack Petrando and Jeff Rutkowski. Petrando is more the workhorse but Rutkowski scored four touchdowns (two rushing, two receiving) last week against St. Edward. Burlington Central, second place finishers in the Big Northern East division, have outscored opponents 151-17 during their current four game winning streak. The Rockets have only lost two games this season by a total of five points. The Rockets offense is led by running back Joel Bouagron. The 6’1, 205 lb. junior has rushed for 376 yards and five touchdowns over the last two weeks. 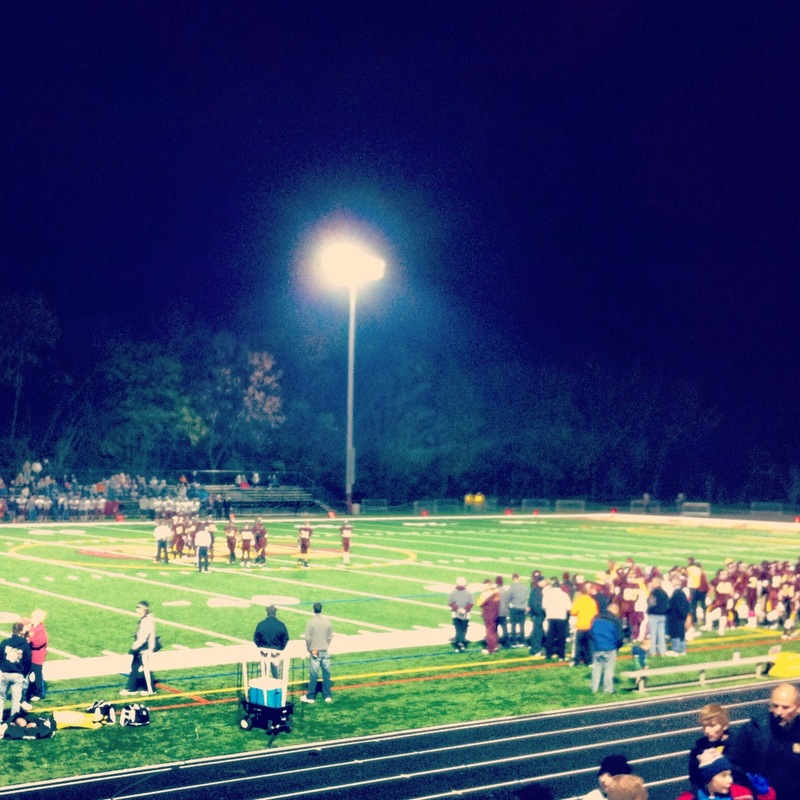 Montini cruised to victory under Friday night lights in Lombard. 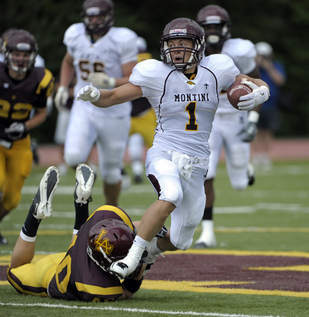 It’s hard to imagine a team getting off to a better start than Montini did Friday night. Quarterback John Rhode threw three touchdown passes in the first three minutes of the Broncos’ 54-6 victory over Wheaton Academy in Lombard. Rhode finished the game completing 18 of his 25 pass attempts for 328 yards and seven touchdowns. Rhode has now thrown for more than 1,100 yards and 22 touchdowns in just over 10 quarters of play since coming back from a broken right thumb. Interceptions by Montini defensive back Joe Cione on back-to-back possessions led to touchdown passes of four and six yards by Rhode on his first two pass attempts of the game. Rhode threw a four yard touchdown pass to wide receiver Jordan Westerkamp on Montini’s first offensive play of the game and the Broncos led 7-0 just 14 seconds after kickoff. Rhode’s six yard touchdown pass to wide receiver Joe Borsellino gave Montini a 14-0 lead just a minute into the game. Running back Dimitri Taylor took a shovel pass from Rhode and ran 41 yards into the end zone just two minutes later, and the Broncos led 21-0 with nine minutes remaining in the first quarter. Rhode threw touchdown passes to five different Bronco receivers. Westerkamp (7 catches, 105 yards) and Borsellino (5 catches, 74 yards) both had two touchdown grabs, while Mark Gorogianis, Anthony Taylor and Dimitri Taylor each had one. “Our quarterback is the guy who makes it all work, but our receivers are really good. It’s a very special group of kids,” said Andriano. Wheaton Academy (1-8, 0-5) quarterback Drew Decker threw a two yard pass to wide receiver Mark Lindsay early in the second quarter for the Warriors’ only touchdown of the game. “Everything seems to be rolling. We can’t wait to find out who we’re going to play in the first round. We’re really excited to get started,” said Westerkamp. Montini comes into this week’s game against Wheaton Academy on a four-game winning streak and fresh off a 75-0 shellacking of Walther Lutheran. The Broncos have outscored their opponents 222 to 42 over that stretch. Rhode is being helped out by a very talented receiving corp that includes future Nebraska Cornhusker Jordan Westerkamp. In the eight quarters Rhode has played, Westerkamp has caught 15 passes for 328 yards and seven touchdowns. Joe Borsellino has 12 receptions for 170 yards and three touchdowns, and Anthony Taylor has nine receptions for 252 yards and four touchdowns since halftime of the St. Francis game. 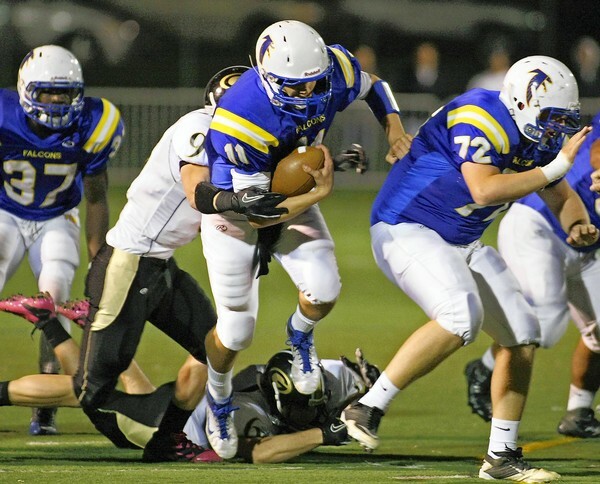 Borsellino remains a dual-threat as the “JoeCat” offense made an appearance last week. The senior receiver took a direct snap and ran 19 yards for a touchdown on a fourth and two play in the first quarter. Mark Gorogianis, the Broncos’ starting quarterback the first five games of the season, has moved to wide receiver and has caught two passes for 21 yards and a touchdown. If Montini can continue their high level of play on both sides of the ball, the Broncos have an excellent shot at winning a third straight class 5A state championship. Taylor has been a big player for the Broncos since Rhode entered the lineup. The senior receiver has caught nine passes from Rhode for 252 yards and four touchdowns. The big-playmaking Taylor has collected most of his yards after the catch, breaking tackles and alluding defenders. Taylor only had three catches last week, but they all went for over 40 yards, including touchdowns of 44 and 56 yards. Taylor combines with Westerkamp and Borsellino to give the Broncos a deep, talented and dangerous group of wide receivers. Get ready for a running clock. Wheaton Academy will not present much a challenge as Montini tries to win their fifth straight game. The Warriors have lost four straight games and their only win this season came against winless Chicago Christian. Rhode should put up big passing numbers again in the Broncos final tune up before the playoffs. Quarterback John Rhode threw four touchdown passes as Montini completely dominated Walther Lutheran Saturday afternoon, winning the battle of the Broncos 75-0 in Melrose Park. Rhode has now thrown for over 800 yards and 15 touchdowns in just over eight quarters of play since making his Bronco debut Sept. 30 against St. Francis. Rhode, a transfer from Marian Catholic, missed the first five games of the season recovering from a fractured right thumb. 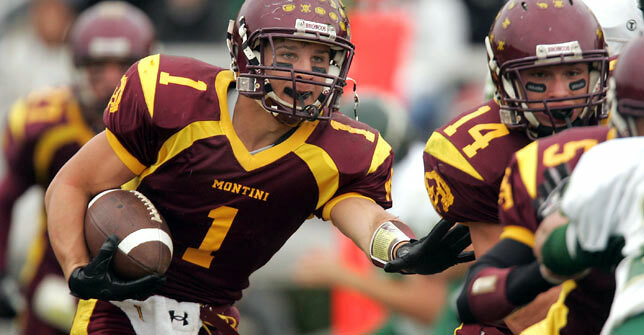 Montini (6-2, 3-1) has won four straight games and has scored 222 points over that stretch. Rhode’s first touchdown pass of the day came on a 50 yard connection with wide receiver Jordan Westerkamp. Westerkamp also caught a one yard pass for a touchdown in the second quarter. The Nebraska-bound receiver finished the game with 8 catches for 183 yards. Montini’s second touchdown of the day came out of the “JoeCat” offense. On fourth down and two, Joe Borsellino took a direct snap and ran 19 yards for a touchdown that put Montini up 17-0 with four minutes left in the first quarter. 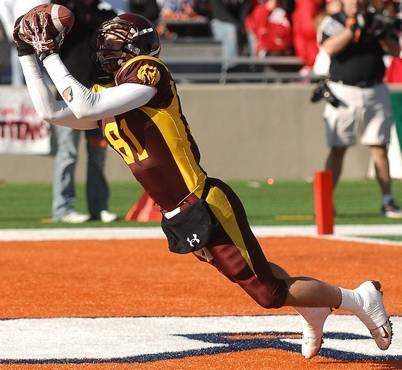 Wide Receiver Anthony Taylor also had a big day for Montini. The senior caught three passes for 152 yards and two touchdowns, including a 56 yard grab that put the Broncos up 45-0 right before halftime. Running back Dimitri Taylor had touchdown runs of one and 42 yards for Montini. Even the Montini offensive lineman got in on the scoring. With eight minutes remaining in the fourth quarter, Walther Lutheran punter Paul Stahlke’s rugby style punt landed in the arms of Tony Michelon and the big junior ran seven yards into the end zone to put the Broncos up 75-0. Not to be overshadowed, the Montini defense also had a dominant performance. The Broncos defense did not allow Walther Lutheran to get past the 50 yard line and only gave up 24 total yards. Iowa-bound Jaleel Johnson and the rest of the Montini defensive line wrecked havoc all game long. The two-time defending state champion Montini Broncos are rounding back into championship form just at the right time. The Broncos have won three straight games after starting the season 2-2, and have scored 30 plus points in every game. The Broncos’ surge is due in large part to the addition of quarterback John Rhode. Rhode, a senior transfer from Marian Catholic, missed the first five games of the year while recovering from a thumb injury. Rhode has been exceptional since he took over the quarterbacking duties at halftime of the Broncos’ week six game against St. Francis. In just six quarters of football, Rhode has thrown 11 touchdown passes including five to star wide receiver Jordan Westerkamp. 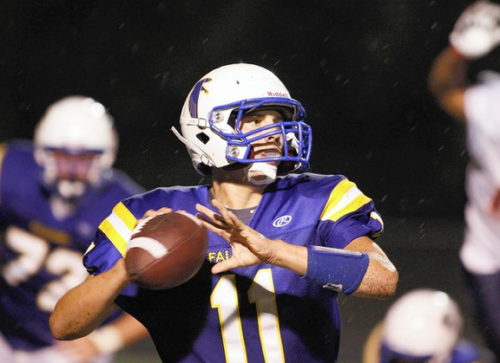 Rhode completed 17 of his 21 pass attempts for 349 yards and eight touchdowns last week against St. Edward. Yes, Rhode threw EIGHT touchdown passes in last week’s game. 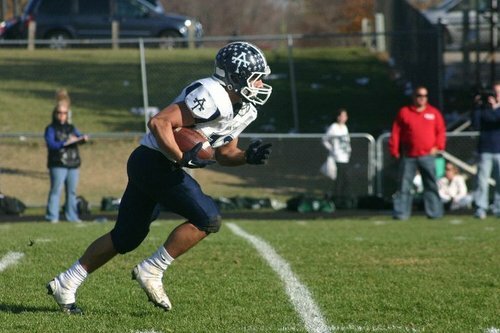 Rhode has a stable of solid targets to throw to, including future Nebraska Husker Westerkamp. Westerkamp caught three passes, all touchdowns, for 101 yards last week. Joe Borsellino, who has also taken snaps in the “JoeCat” offense this season, caught eight passes for 121 yards and two touchdowns. Mark Gorogianis, the starting quarterback for the first six games, has moved to wide receiver and caught a touchdown pass last week. The versatile Borsellino has been one of the most important players for the Broncos this season. When the offense was struggling before Rhode came back from injury, Borsellino gave the Broncos a jolt with the “JoeCat” offense. In the Broncos’ week five victory over Aurora Christian, Borsellino had 152 yards of total offense and four touchdowns (he scored them three different ways: he ran for two, threw for one and caught another). With Rhode back and playing well, it will be interesting to see if the Broncos will break out the “JoeCat” again at some point. Even if he’s just needed as a pure wide receiver, Borsellino will still contribute greatly to the Broncos. He caught eight passes for 121 yards and two touchdowns last week. Walther Lutheran will not pose much of a threat to Montini this week. Get ready for a running clock, Rhode and the Broncos should roll to another dominant victory. After playing 2-5 Walther Lutheran, Montini finishes off the season with a home game against 1-6 Wheaton Academy. Montini should be heading into the playoffs with a 7-2 record, fresh off a five game winning streak. The addition of Rhode has to make the Broncos one of the favorites to win the 5A title this season.